The climate issue is so overblown and paranoid now that a few cents of tax, or not, in one country is seen as a big setback. The French people have spoken, and the cash-hungry global climate industry doesn’t like their pushback against its tired dogma. Macron’s decision to suspend the carbon tax increase ‘sends a very bad signal,’ warn campaigners. KATOWICE, Poland — France’s sudden U-turn over an unpopular fuel tax in the face of violent anti-government protests sent shivers through the COP24 climate summit. That’s because the sight of one of Europe’s most climate ambitious countries beating a hasty retreat over a proposal that would have hiked gasoline tax by 4 cents, or just under 3 percent, highlighted the difficulty of imposing any economic pain in the name of tackling climate change. The tax proposal sparked weeks of riots that devastated Paris, blocked highways across the country and left four people dead. France’s troubles were seized upon by climate skeptics to underline the unpopularity of costly decarbonization efforts. Macron Antoinette is experiencing the truth of Prof. Pielke’s Iron Law. And, like his predecessor, Marie Antoinette, he and those in their echo chamber don’t get it. The climatocracy has lived in their exclusive echo chamber, refusing to discuss, much less honestly debate, the hysterical extremism of their obsession. The chain of events the arrogant climate extremists have triggered is not surprising. Fox news, newly exploring it’s new anti-Trump persona, is predictably calling the failure if the Polish climate hype meeting, is blaming the results on President Trump. They even call it the “Trump effect”. Fox demonstrates clearly in its new found enthusiasm the debilitating effects of climate obsession. When climate obsession is embraced, it quickly corrodes cognitive performance, leading to a disconnect between reality and rhetoric. This has of course been the case with other media like BBC for years. It is just that Fox, under its new generation of leadership, is showing how quickly this syndrome can cause damage. People really don’t want to have ever higher costs imposed in them in the name of climatocracy. And the people will push back against climate nonsense at some point. Have any skeptical point of of view been actually considered? According to the backers of Macron Antoinette, it is Trump’s fault. They really don’t get it. Electric cars not a runaway success…< 1% of annual US sales of BMW. BMW brand sales of electric and plug-in hybrid electric vehicles totaled 2,314 in November 2018, a 25% decrease from the 2,725 sold in the same month a year ago. In total, BMW Group (BMW and MINI) electrified vehicles accounted for 7.7% of US sales in November 2018. Year-to-date, the BMW brand is up 1.9 percent on sales of 276,657 vehicles compared to 271,432 sold in the first eleven months of 2017. The Trump administration has said it plans to end subsidies for electric cars and renewable energy sources. PARIS (Reuters) – U.S. President Donald Trump has taken another swipe on Twitter at his French counterpart Emmanuel Macron prompted by Macron’s woes over violent protests against fuel taxes. “I am glad that my friend @EmmanuelMacron and the protestors in Paris have agreed with the conclusion I reached two years ago,” Trump tweeted late on Tuesday. “The Paris Agreement is fatally flawed because it raises the price of energy for responsible countries while whitewashing some of the worst polluters,” said Trump, referring to a global deal on the environment drafted in Paris in late 2015. Game over for carbon tax on motorists…’a warning to other world leaders trying to do the same thing’. People are worried about their budgets, not airy-fairy ‘climate change’. 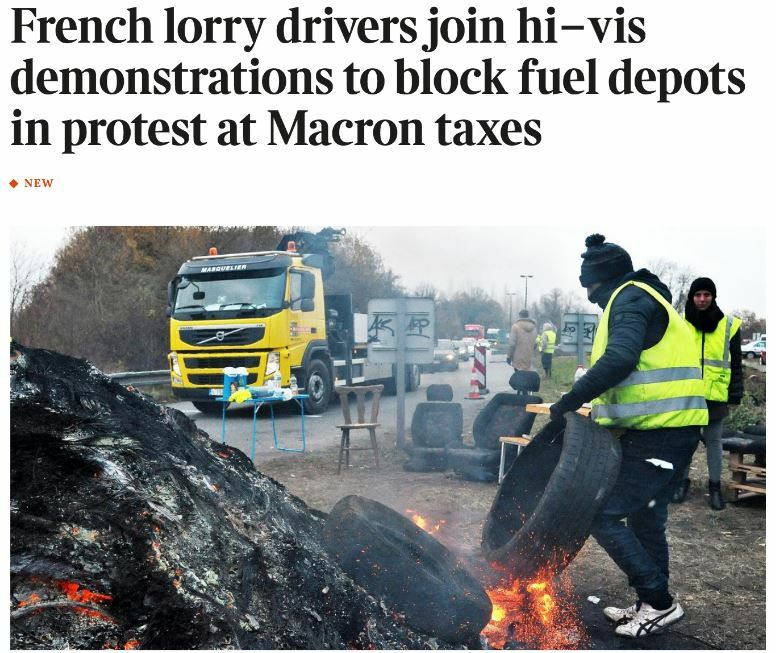 PARIS — French President Emmanuel Macron scrapped a fuel tax rise Wednesday amid fears of new violence, after weeks of nationwide protests and the worst rioting in Paris in decades. Protesters celebrated the victory, but some said Macron’s surrender came too late and is no longer enough to quell the mounting anger at their president, whom they consider out-of-touch with the problems of ordinary people. Macron decided Wednesday to “get rid” of the tax planned for next year, an official in the president’s office told The Associated Press. Prime Minister Edouard Philippe told lawmakers the tax is no longer included in the 2019 budget. The decision has ramifications beyond France, since the fuel tax rise was part of Macron’s efforts to wean France off fossil fuels in order to reduce greenhouse gases and slow down climate change. Its withdrawal is both a blow to broader efforts to fight climate change and a warning to other world leaders trying to do the same thing. How’s that Paris Agreement going?